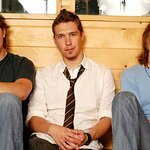 Hanson used their appearance at the South By Southwest Festival in Austin, Texas, last night to stage a 12-hour telethon for victims of Japan’s devastating tsunami. Featuring R.E.M. 's Michael Stipe, The Parlotones and many others, the celebrity charity concert was streamed live online and raised money for the American Red Cross. The telethon was drawn together in a short 24 hour period through tremendous efforts from all involved, with the aim of offering assistance and support to victims of the magnitude 8.9 earthquake on March 11th, 2011. The earthquake and resulting tsunami has left countless dead and homeless across Japan and the Pacific region. With the greatest minds in music, film and interactive media gathered in Austin for the week, Hanson and SXSW partnered to capture the rare opportunity for the world of music to impact the world of those in need. Artists from across the globe gathered in a downtown studio location to make inspiring music and encourage viewers to donate funds to the American Red Cross. Friends and acquaintances from across the music industry gathered from 12 pm Saturday to 12 am Sunday to donate their time – and music – to support the cause. Appearances included Michael Stipe of REM, John “JoJo” Hermann of Widespread Panic, the North Mississippi Allstars, The Boxer Rebellion, Hanson, Johnny Polygon, Andy Grammer, Stephen Kellogg, Anna Nalick, Jackson Harris, Charlie Mars, Bowling For Soup, Stephen Kellogg, An Horse, AWOLNATION, The Parlotones, Dale Earnhardt, Jr., Rayland Baxter and many more. Yoko Ono and Lou Reed are also scheduled to appear in charity concerts for Japan in the near future.